New Concord Home w/ Dock in Boyd's Branch Bay! Welcome to Ky lake! 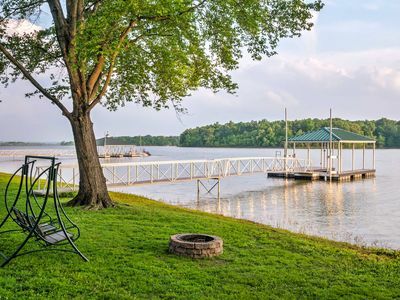 If you are looking at vacation rentals on Ky lake, then you probably already know the beauty of the landscape and nature that surrounds, as well as Ky lake being the largest man-made lake in the nation! This particular home, as we lovingly reference it as our lake point cottage, leaves no room for error with it’s views…they are breathtaking, and will NOT disappoint! 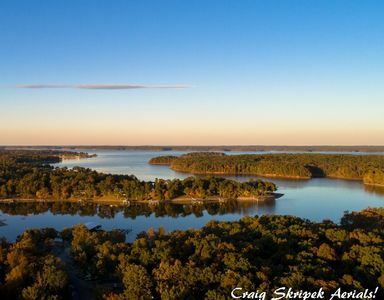 This lot is referenced as the best on Kentucky Lake as it provides infinity views from 270 degree angles! The home boasts two bedrooms; one bathroom; living space; kitchen equipped with dishwasher, refrigerator, microwave, stove and disposal; a large sunroom boasts a dining table with seating for 10 and a relaxing sofa to take in the views; washer and dryer located in closet; a covered porch with seating in case weather takes a turn; 2 covered docks, one available to house your own boat located in a cove and the other covered dock boasts two jet ski lifts, a sun deck with plenty of room to lounge and located on the main channel. If there is a chill in the air, take advantage of the oversized fire pit and recline in the Adirondacks that circle it…the perfect place to roast hot dogs or put together s’mores! A bonus is the 2-3 person kayak for you to enjoy at your leisure! 2016 Sierra by Forrest River is loaded with every camper, fisherman, or hunters dream. 38 foot limited edition....3 slides.....huge shower with bench....queen bed in back fold out full size sleeper sofa and 2 recliners all leather....dinette seats 4......two airconditioners, fireplace, and all the comforts of home you will need for an amazing vacation, weekend getaway, fishing trip, or hunting trip.....boat launch and marina within a short walk....parking for 2 vehicles or a truck and boat......restaurants close ......large deck with perfect view of Kentucky Lake. 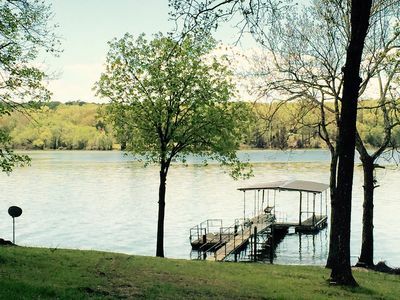 Lakefront Home with Dock and Private Boat Ramp, Is Ready for You! This is a great house directly on Jonathan Creek. 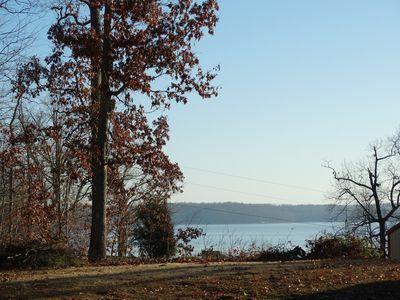 Jonathan Creek connects directly to Kentucky Lake, and is convenient yet private. The 2 place covered dock provides protection for your boat(s), as well as a great spot for fishing and swimming. The private boat ramp also makes boating a real convenience. The house offers great views of the lake, modern appliances, a large, lakeside deck and plenty of room on its 2 acre parcel. Final upgrades and improvements are underway and pictures will be posted soon. 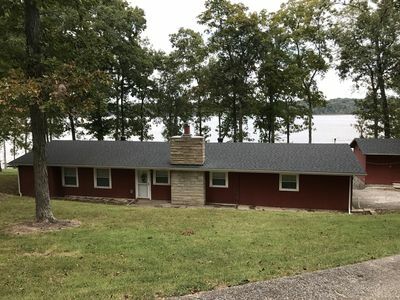 Kentucky Lake House on Jonathan Creek! This 5000 sq.ft. house allows for peace and quiet not only inside but also on its large wooded grounds, and boasts unbelievable views from the large deck, dining room, and eat-in kitchen. Located in the great area of Jonathan Creek(one of the more popular fishing and boating areas on Kentucky Lake), the house comes with a two slip covered dock with an attached sun deck and is less than 2 blocks away from a public boat launch with places to rent boats nearby if needed.The house includes two living areas on separate levels with a walkout to a concrete patio and an outdoor fire pit on the lower level. A recreation room can also be found in the lower level of the home. In addition, there is a two car attached garage as well as ample parking on a large U-shaped driveway for all guests. 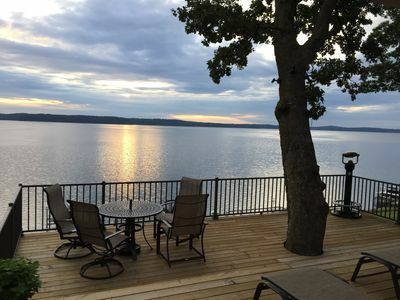 SEE OUR OTHER LISTING #353951 FOR UP TO 6 GUESTS Featuring the Finest Properties and Rental Boats on Kentucky Lake, guests enjoy special rates on our Fish and Ski Boats with whisper-quiet Yamaha outboards. Perfect for watersports, fishing or just cruising. Please contact KENTUCKY LAKE VACATION RENTALS for pricing on our entire fleet... All boats are delivered to your Private Covered Dock, only 100 ft. away. For Summer Guest's (Memorial Day thru Labor Day) bringing a boat, there will be a docking fee. Please indicate length and type of boat with your inquiry. Thank you. (Please review additional information below Rates & Availability). ____________________________________________________________________________________________________________ THE COTTAGE The architect's plan for this refurbished, lovely stone cottage, positioned with truly the greatest view of the main Lake, was to create the ultimate retreat for couples or friends in search of unmatched location and prime fishing. The perfect base from which to explore Kentucky Lake has successfully been constructed. The 680 square-foot lake front area of its deck offers spectacular sunrises without another structure in sight - only a calm unspoiled setting - the lake and nature. This majestic environment seems complete as visitors experience the remarkable image of a Bald Eagle reflected on the water as it soars in to perch on the branch of a surrounding tree. The wrap around deck totals 1100 square feet and is the ideal place to discover the beauty and serenity of Kentucky Lake by the light of day or under a starry sky at any season of the year. There is no more beautiful setting to begin or end your visit to the Lake. Conveniently located only 13 miles from Murray State University. We do include Free WiFi. While the cottage's design maintains a rustic mood special attention has been paid to provide distinctive quality furnishings and unique amenities that ensure the guests' comfort and a restful visit. The top floor of the cottage has a cathedral ceiling. The living space and dining area feature a grand stone fireplace and floor to ceiling windows that share the main deck's great views. Two well appointed queen bedded rooms and a full bath are also upstairs. 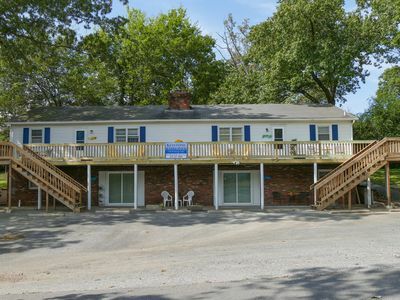 Downstairs with a separate entrance is a quaint twin bedded room with a full bath, as well as a laundry facility. Enhancing and maintaining quality is a happy necessity that keeps our customers returning. Ensuring that every season be one of great memory making we recently installed a new custom boat dock adjacent to the cottage and added an on property boat rental. A very thoughtful process of considering what features make for the best waterfront experience has brought about many conveniences with the addition of the deluxe dock: First, There is the Access - Here there is no steep slope or long trek to your boat. Being only one hundred feet away, step out the door and be on the dock in a minute or less. Coverage and Quality are Redefined – Equipped with an attractive and highly functional hip roof, superior protection from the elements is ensured. It has one 24 foot covered slip. Not only is the aluminum decking non-slip, but it is splinter free. The dock has the option of electricity for charging trolling motors. Then, there is the Relaxation & Recreation – If after a day out you return full of the sense that exploring and playing on the lake can be both fun and hard work, here is the place to reflect on the day you have had and contemplate tomorrow’s plans. Having a 12x28 swim platform complete with a retractable ladder makes this the spot to share a fun and rejuvenating break lounging, sunbathing or swimming. We cannot forget the Exceptional Fishing Possibilities - Many of the cottage’s guests return to revisit the location right on our lakefront where they have had very rewarding days fishing for blue gill, bass, crappie, and catfish. We are confident that their future visits will leave them happily convinced and surprised that their past successes here have been surpassed. 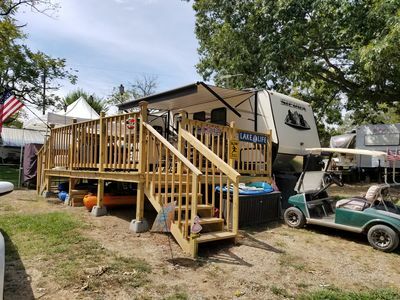 There is ample parking on the property for a boat trailer, and a marina with fuel is conveniently located just one cove away. 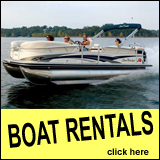 The Property Boat Rental: Several well-equipped boats are available to guests at special rates. It is one more convenience, and can add hours to vacation time on Kentucky Lake. There is no drive to and from a marina to collect and return a boat. For a rental over multiple days how great it is to have the driving completely eliminated? Imagine instead the pleasure of a sunrise breakfast ending seamlessly with a stroll across the lawn to board the boat that awaits you at your private dock. Effortlessly, straight from the comfort of your cottage a day out on the lake begins... ______________________________________________________________________________________________________________ While visitors may be satisfied to not leave the property during their stay, there are many great experiences to be found locally: FISHING: The fish are surely not hard to find, but for visitors with the goal of maximizing their fishing experience the owners have established relationships with the areas most knowledgeable guides. We are delighted to introduce guests to any one of these specialists who have each made it his life's passion to master and uncover this lake’s greatest features - impressive fishing opportunities and a wide array of wildlife. They are at the disposal of the expert or the novice and promise anyone wishing to learn and have the mysteries of Kentucky Lake revealed a day that will long be remembered. GOLF: In addition to the satisfaction a day on the water offers, just a 15 minute drive away is Miller Memorial Golf Course - considered to be one of the finest golf courses in west Kentucky's lakes region, it presents many challenges for even the most seasoned golfer. LAND BETWEEN THE LAKES: Guests have a direct view of the Land Between the Lakes from the cottage itself. It's just a 15 minute drive away. It is a national recreation area with 170,000 acres of wildlife, history, and outdoor activity opportunities, surrounded by 300 miles of undeveloped shoreline. LBL’s Elk & Bison Prairie is a 700-acre restoration of Kentucky’s native barrens. The Homeplace is an 1850’s working farm where west Kentucky’s history comes alive - Interpreters in period clothing demonstrate on a daily basis the chores and activities of another time. There are special events and festivals for every season. On another day one might return to explore the 200 miles of trails, the Nature Station, or the Golden Pond Planetarium & Observatory. ______________________________________________________________________________________________________________ Keywords:Kentucky Lake Boat Rentals, Kentucky Lake Vacation Rentals, Private Covered Dock, Lake Front, Pet Friendly, Private, Perfect for Families. 3 Bedrooms, 2.5 Baths, Pool (not heated)(NO SPA) ,dining Room, Large Den, Covered Dock With Sundeck, Two Jet Ski Pads. Fireplace Inside and Outside , Granite Counter Tops, Tile and Hardwood Floors. 3 Flat Screens Tv's, Washer & Dryer, This Home Has Just Been Remodeled With Granite Countertops, Tile Floors, Hardwood Floors. a Wrap Around Deck and Garage. You Can Hunt On Owners 52ac. Hunting Land Just 10 Mins Away (for additional fee). Please note the pool is closed from Oct. 1st to May 20th due to inclement weather. The pool spa dose not work.This property only allows 6 people. If more people please email owner. The property is located on Kentucky Lake TVA controls lake levels. Early spring and fall levels will vary. During this time boats may not be able to dock at boat dock. Boat can be launched 2 mins away at Wateredge Marina. During late Aug. Sept. Oct. Nov. no boats can be docked. There is a beach around the dock perfect for bon-fires, roasting marshmellows and hotdogs. Chairs are available for the dock. Perfect for those cool nights with the harvest moon shining on the water. This house features beautiful main lake views. 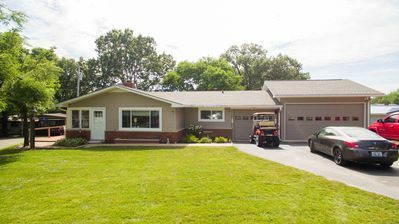 The property has been completely remodeled in 2017 with all new stainless steel appliances, tile flooring, freshly painted walls and so much more. It is perfect for family/friends up to 8 guests. The gentle slope to the lake makes it ideal for guests of all ages and the brand new double bay dock is perfect for large and small boats as well as fishing and swimming around it. This property has deep water all year and plenty of parking for 4 vehicles and 2 boat trailers. Nice and safe neighborhood less than 1 mile from Moors Resort & Marina. Spacious 5,500 sq. ft, 5 bedroom, 4 bath home with open floor plan and finished walk out basement, sitting on 1.8 acres on dead end street. 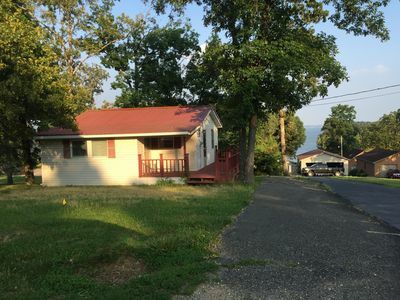 The home is located 2 blocks from a public boat ramp and a 1/2 block from Jonathan Creek, one of the more popular fishing and boating areas on Kentucky Lake. The home has a circular dive with ample parking. 800 sq. ft. deck, oversized two care garage and boat slip on dock. This house features oak hardwood and ceramic flooring in common areas. 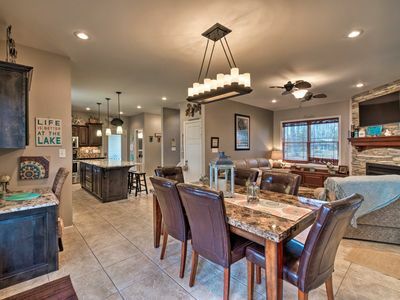 This home features a beautiful, well furnished kitchen with eating bar and stools plus a breakfast nook and stool. The dinning room has a table with seating for 8. There are two main sitting areas on main level which are furnished with leather furniture, one with a big screen TV and DVD player and the other with TV, fireplace and desk area. There are four carpeted bedrooms located on the main level. The master bedroom has a king size bed with separate tiled bath, Jacuzzi tub/tiled shower combination, TV, and patio doors to the deck area. The second bedroom includes a queen bed with TV. The third bedroom has a beautiful antique bedroom set and full bed. The fourth bedroom has a bunk bed set including desk and drawers and a separate twin bed. Bedrooms all have an abundance of storage for your items and are within easy access to a beautiful community bath with toilet, tub/tiled shower combination and double basin with double mirrors and cherry vanity. There is also an additional bath and laundry room with washer and dryer, which is separate from the bedroom and living areas, on the main level as well. The gorgeous walk out basement features ceramic tile floors, recessed lighting, one bedroom with one full bed and one twin bed, kitchen, full bath, foosball and ping pong tables, sitting area with a TV, as well as a sofa with a pull out sleeper. The two hot water heaters, two central heat and air units and two refrigerators with ice makers will keep your comfort level high whether you are enjoying yourself on the main level or the basement during your stay. This may be the Newest Lakefront property on Kentucky Lake. Builder handed over the keys the first of May (2015). 4 bedroom, 2 bath with New everything! Covered porches that overlook the lake. Boat parking at the house. Completely furnished except your personal belongings. Less than a mile from Moor's Marina, boat ramp, restaurant, and playground for kids. Location may be the best on the Lake as well, just across from popular local spots-"the sands" and "the rock quarry". Very gentle slope to the water. Walk out downstairs and stroll to the dock to fish, watch boats go by or swim. New grill-gas and charcoal for your cookouts! Or we have several favorite restaurants just a few minutes away. This well-appointed waterfront lake home is nestled on almost an acre lot on a private dead-end road. This home features an open floor plan, utility room, 4 bedrooms, 2 bathrooms, enormous all-season porch, large deck, fire pit, swing set, ample parking for multiple vehicles, and large private dock with swimming platform and deep water year-round. The master bedroom is furnished with a queen-size bed, television, and a private bathroom. The second bedroom has a king size bed and a television. The third bedroom is furnished with a queen size bed and a television. The fourth bedroom we refer to as the bunk house. This is our largest bedroom and is perfect for kids! The fourth bedroom is furnished with a large television, games, and two bunk beds. Oue home can comfortably sleep 10 without using cots, couches, or blow-up mattresses. The kitchen is fully stocked with everything you need to prepare your own meal! The all-seasons porch (heated and cooled) is well-furnished with patio furniture and an amazing 180-degree view of Kentucky Lake! You will not find a house with a better view of Kentucky Lake! There is a gentle walk from the house to the private dock, great fishing from the dock or by boat. There are numerous options for launching a boat within one mile of the lake house. The private dock has year-round deep water (3-4 feet in winter pool) and is great for swimming in the summer; there is a ladder at the dock and swim platform to layout and get some sun! The back deck is enormous and goes the entire length of the house; there is also a fire pit and swing-set for your enjoyment. Newly remodeled 3 bedroom, 2 bath home just steps away from Moors Resort and Marina. You cant beat the location and access to so many amenities! 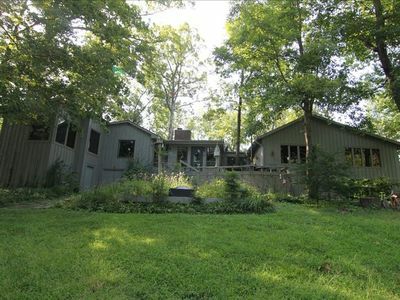 This home sets on a gentle sloped yard with direct access to the lake and private boat dock. Large patio (partly covered) perfect for entertaining. The large also feature a fenced in yard and great for kiddos and pets. You don't want to miss the chance to stay at Harbor House! Paved access to lake and private boat dock! Deep water year round. This two (2) bedroom cabin is perfect for a short or long getaway! 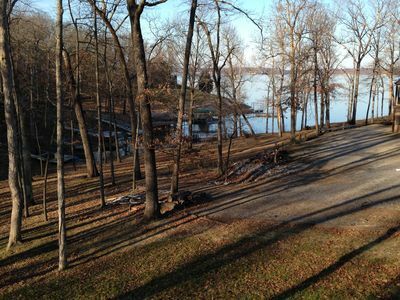 It is steps away from beautiful Kentucky Lake and comes with access to a private boat dock for your rented or personal water craft. The property is fully furnished with towels, linens, cookware and Dish satellite TV. The property is less than a mile from the award winning Moors Resort and Marina & Ralph's Harborview Bar & Grill where you will find boat ramps, great eats and entertainment for the whole family. Welcome to Inspiration & Selah, our home and cottage, on beautiful Kentucky Lake. 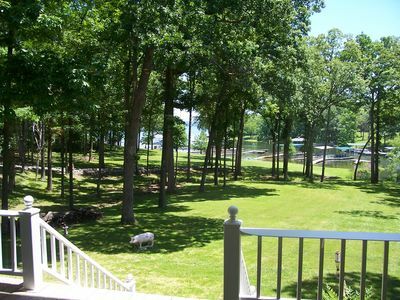 Our home is an open area home upstairs with full views on 3 sides of house of Kentucky Lake/Tennessee River. You can watch all the activities on the lake right from our dining room table, kitchen or living area. There is also a 1/2 bath upstairs. You can open up our doors off the living area to a walkway that goes around to the left of the house to a walkway going down to our screened in porch, deck with pergola and then the deep water dock. Downstairs is 3 bedrooms. One bedroom (it has two large closets) has a king size bed with room on the floor to add air mattress and two bedrooms each hvae queen size beds with closets. The bathroom downstairs is 10 x 20 and has a shower, separate oversize tub and two lavatories. We also have a washer and dryer downstairs. Each downstairs bedroom has doors that lead you out to the 30 x 15 screened in porch. Our porch has views of the lake on all open sides with plenty of seating for a large group of people. We have a tv, apartment size refrigerator & freezer located in the screened in porch. Check our pictures out to get a better idea of the relaxing time you can spend with your family and friends in our screened in porch. On those hot days you can turn on the ceiling fans and floor fans, get a cold glass of tea and enjoy your visit in our home. There is a screened in door on the left side that will allow you to go down to the deck/pergola and ultimately to the dock. Dock can be used (use at own risk)to swim, sit and bring your boat. Boating activities such as skiing, tubing, water boards or just swimming is only a few feet away. Fish from the dock if you prefer. Upstairs there are three carports and a parking area beside the Cottage. Selah, our cottage, has 2 bedrooms, and an open area with kitchen and living area. A full size bath. Selah has a queen size bed in one bedroom and 2 twins in the other with open to kitchen and living room. The living room has a sofa sleeper and a rollaway bed. Selah is only 8 feet away from Inspiration. Come enjoy our home on the beautiful and scenic Kentucky Lake. You will be glad you did. It's time to get away. 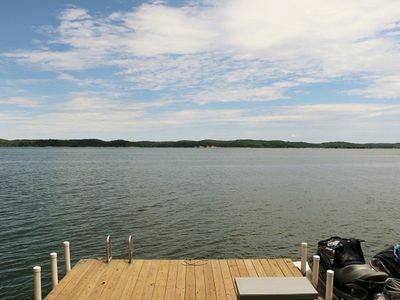 Kentucky Lake 3 Bedrooms, 2 Bath Private Home W/Private Dock and pontoon rental. 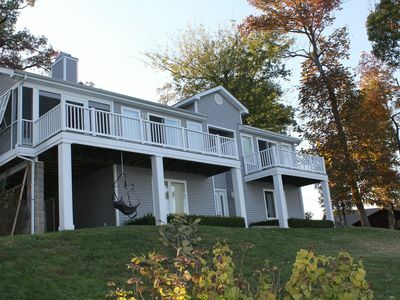 Our private home (not a part of Shawnee Bay Resort) is located on Kentucky Lake and is overlooking the water. It is a 3 bedroom, 2 bath home with floor to ceiling windows overlooking the water. There is over 1,000 ft of deck space for entertaining and just a short (approximately 125 ft) walk to the water. All bedrooms have televisions and DVD players. The master bedroom is equipped with it's own bathroom with tub, king size bed and has a 42 inch plasma TV with surround sound and DVD player. The second bedroom has a queen bed and a 42 inch plasma TV with DVD player. The third bedroom has a queen bed with a 32 inch TV and a DVD player. 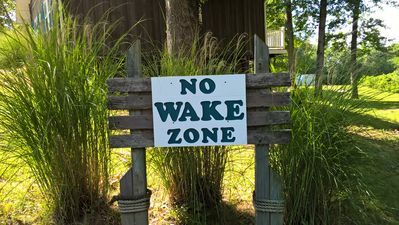 Kentucky Lake is about being outside, we are a MOSQUITO FREE lake house, our home is treated throughout the year by MOSQUITO AUTHORITY and they guarantee a mosquito free environment. If you see a mosquito while you are on our property call us and Mosquito Authority will come a treat the area again. We only rent weekly from Saturday to Saturday from Memorial Day week to Labor Day week. During the off season we have a 3 night minimum at $250.00 per night plus taxes and $100.00 cleaning fee. The living room, dining room and kitchen are all open to one another and is a great place for the whole family. The dining room table is massive enough to accommodate everyone staying at the house and a couple more that may be stopping by for dinner (at least ten). We understand that at night you might be ready for a movie, so the living room is equipped with a 50 inch 1080p Samsung TV and Samsung Blue Ray surround system. There are over 100 movies in the DVD library. If you like, the system will allow you to log onto your Netflix account and rent a movie that way. If you want to listen to music just connect your Ipod to the surround sound or turn on one of the digital music channels. House is equipped with wireless cable internet, so for those who need the internet, we have it at no additional charge. The kitchen is equipped with everything you need for cooking for the whole gang. Pots, pans, griddle, plates, coffee maker, toaster, etc... The deck (over 1000 sq ft) is outfitted with two patio sets and seating runs the entire length of the deck. A charcoal grill is supplied. This overlooks the water and is the best seat in the house. We have a 20ft Bentley tritoon boat that is also available to rent. We can only rent the boat for your full stay, please ask about it if you are interested. You are not going to find a nicer boat for rent on KY Lake. HOWEVER, we have two rental houses, so it may be rented by the other property. Cleanliness is our number one priority. This house is professionally cleaned after every stay, no matter how short. We only do weekly rentals in the summer and holiday weeks (Memorial Day, Fourth of July, and Labor Day) THIS IS A PRIVATE HOUSE AND IS NOT A PART OF SHAWNEE BAY RESORT, OUR GUESTS ARE NOT PERMITTED TO USE THEIR FACILITIES. Keywords: Lake House, Dock, Benton, Marshall, Kentucky Lake, boat, KY Lake, pontoon rental, tritoon rental, waterfront. Newly renovated 2018-19. Fully furnished and ready for your vacation at the lake. Located in Moor's Resort and Marina with many amenities including golf carts, miniature golf, playground, beach, and boat rentals. 7 tenths of a mile to the ramp, marina, and restaurant without ever getting on the main road. Great for fishing or family fun. Separate master suite with king bed. Queen bedroom and bunk room share a full bath. Direct TV with NFL ticket in living room. Smart TVs in each bedroom with free WiFi. Keurig and coffee pot provided. Standard pots, pans, dishes, and coffee cups are supplied. The yard has some flat area and shade for kids to play. Charcoal Weber grill on site. Ample parking for 2+ vehicles and a boat and trailer. KY Lake is a world class fishery known for many species including Crappie, Large Mouth Bass, Small Mouth Bass, and all 3 species of catfish. For fisherman and boaters there are several boat ramps very close including Moor's and Buckhorn. 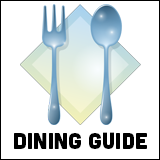 Enjoy the restaurant Ralph's at Moor's just 7 tenths of a mile or a 2 minute golf cart ride away. Cedar Hill Market is just 2 miles away and can serve as your back up if your forget anything (ice, beverages, food, and essentials). They also have a cafe in the store. This newly remodeled fisherman's getaway is located in a resort community with a pool, miniature golf course, and marina. 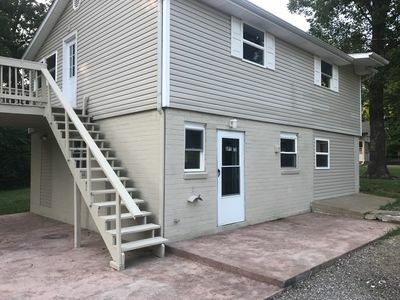 This two bedroom features a covered deck with grill and seating, 4 twin beds with memory foam mattresses, HVAC, flat screen tv, garage large enough for a boat as well as a deep gravel driveway for another boat. Each has convenient electricity for recharging your batteries. The single bath has a full walk in shower (no tub). The kitchen is complete with stove, refrigerator, dishwasher, microwave, coffee pot, toaster, dinnerware, cutlery, and cookware. The garage features a full size washer/dryer as well as a chest freezer to keep your catch on ice during your stay. The resort charges $10 per day to launch at their marina or you are welcome to take a short drive to the public launches at Kenlake Marina or Jonathan Creek. 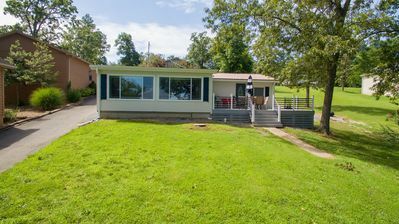 This house is minutes away from Land Between the Lakes with a long list of activities and is only 20 minutes from Murray, Ky and Murray State University. Perfect for fishermen and families. Large rooms and 50 inch TV. Free use of pool and marina with rental. Free boat slip as available. Over 1.5 miles of lake-shore fishing. Kitchen has pots pans knives etc.. Multi- unit discount available. Large parking area that will hold all the boats you and your crew brings. Outdoor fire pit. Pavilion available for group dinners and get together. Start out on the south end of Johnathan creek for early morning crappie fishing. 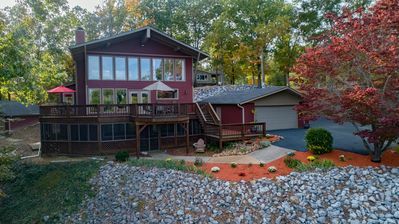 Beautiful 1,800 square foot waterfront home located on Kentucky Lake. The home features 4 bedrooms (1 king, 2 queen & 1 double bed), 2 bath (both with showers and double sinks) and comfortably sleeps 8 people. The home sits on a gentle slope to the lake (safe for children), has a private double bay covered dock for use during your stay, large driveway and several amenities. We promise an enjoyable stay- contact us today for more details. Lake Front Cabin With Covered Boat Dock On Beautiful Kentucky Lake! 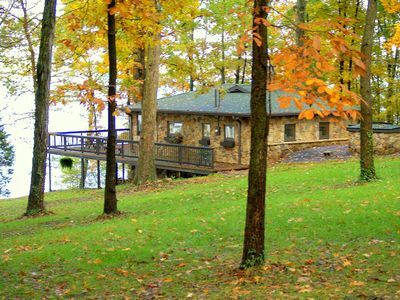 Our Kentucky lake cabin is a great place for a fishing trip getaway or the perfect family vacation home! It has two bedrooms and two baths, & sleeps 6! The master bedroom includes a queen bed and and private full bathroom. It also has a French doors with a private access to the screened in porch. Enjoy the beautiful view right from bed when you wake up! The second bedroom has 2 sets of adult rated bunk beds & sleeps 4, with another full bath right next to the bedroom. The screened in porch is perfect for sitting and enjoying the outdoors & opens out to a full deck with picnic table and gas grill. There is also a backyard firepit area which is great for enjoying an evening after being on the lake and roasting some marshmallows. 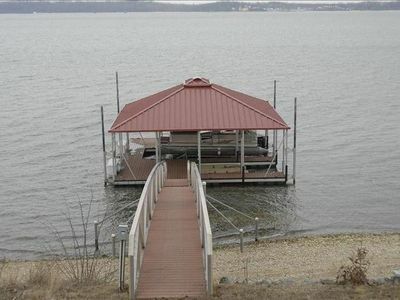 Our home features a covered private dock located on Ky Lake. The dock is right in the backyard with a very gentle sloping hill going straight to the water. The dock has power on both ends and there is a built in fish cleaning station. It will accommodate 3 boats. The Home is fully furnished and includes linens, towels, dishes, cooking utensils, appliances, washer/dryer, dishwasher, wood burning fireplace, AC & Heat. There will be parking for up to 4 vehicles. Satellite TV and Free WiFi are also included. The Boyd's Branch Boat ramp is conveniently located across the bay from our dock & just a few minutes away by car. We are located on Kentucky lake but right in the middle between downtown Murray, Ky and the Paris Landing, Buchanan Tn area. Both of which have a wide variety of restaurants, shopping & activities to choose from. This home is great for all kinds of outdoor activities like Hiking/Fishing/Boating and Biking! Located minutes from Land Between the Lakes a national recreational area home to the LBL Elk & Bison Prairie, the 1850’s KY Homeplace, a working farm where Kentucky’s history comes alive where daily chores are reenacted throughout the year. There are special events and festivals for every season. With more than 200 miles of hiking trails, the Turkey Bay Recreational riding trails for ATV/Jeeps/Dirtbikes, the Nature Station has weekly activities and tons animals/wildlife, or the Golden Pond Planetarium & Observatory, you are sure to be entertained! Incredible sunrises await you as you drink coffee and overlook the main lake. 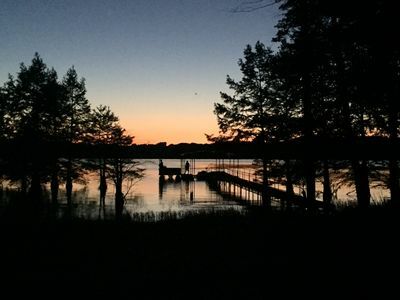 Enjoy our lake home overlooking the main lake with incredible sunrises from a spacious deck. A full renovation was completed on the home this year. We renovated the home with a focus on having a "lake cottage" feel and focusing on being outside! The home features 3 bedrooms and 1 bath. Bedroom one has a king bed, bedroom two has 2 queen beds, and bedroom three features a custom built bunk bed with an extra long twin on top and a full size mattress on bottom. The home also features a full length sunroom with full views of the lake. The new expanded two-tier deck features a large oak tree towering through the middle of the deck and providing a canopy of shade during the day, and lighting hung from the tree at night. We have also included an antique viewer purchased from a resort in Banff, Canada. Looking through this viewer you can see full detail across the lake into Land Between the Lakes or any boats on the water. If you want to get closer to the water, there is a second deck down at the shoreline. This deck features chairs for lounging above the waters edge. If you choose to get even closer to the water, you can take advantage of the newly installed dock extending 70 feet out from the shore with a 10x40 platform. Feel free to fish, lounge, swim or pull your boat up to the dock for the day. The home sits privately down the hill located behind the garage. There is parking for 3 cars. If you want to bring your boat, you are within a mile of 2 boat ramps. If you only have one vehicle, you will be able to park your boat parallel to the road in front of the garage. A second option would be to contact Moore's marina and rent a slip for your stay and simply keep your boat there. The house is less than a mile from Moore's. You will find all the comforts of home including a full kitchen, refrigerator, stacked washer and dryer, cable and Wi-Fi. Of course, the idea with the lake house is to NOT be inside, but if you must, you will find a very comfortable home. For fun, you are within minutes of Land Between the Lakes which boast 170,000 acres of activities including 500 miles of hiking, biking, off-road riding, horse bike riding, Woodlands Nature Station, Elk & Bison Prairie, Homeplace 1850s Working Farm, and Golden Pond Planetarium and Observatory. You are also within 30 minutes of Murray, KY, home of Murray State University and 30 minutes away from Paducah, KY and 2 hours drive to Nashville. Moore's Marina has a very good restaurant that serves both lunch and dinner. We are very proud of the home and are excited to share it with you. If you are like us, once you settle in, you won't want to leave. The water keeps calling you back. The beautiful sunrises are breathtaking and the evenings down on the dock make you realize that life still has some places that aren't as busy. Our townhouse has two bedrooms and one bathroom. The bedrooms are fully furnished and have new Queen size beds. They have a fully equipped kitchen, dining area, living room with one queen size sleeper sofa, color TV with cable. The front doors open onto a deck that offers Southern style wrought-iron and wicker furnishings. The maximum occupancy is 6 adults. Gas and charcoal grills are provided. We also have 3 bedroom units available. This beautiful lake house was constructed in the summer of 2014. 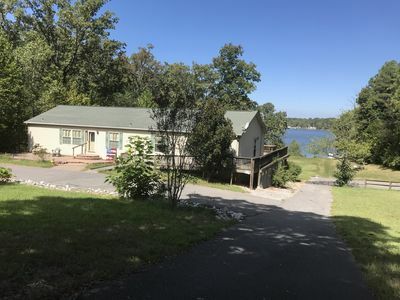 The open floor plan features two bedrooms on the front of the home with the living room and master bedroom on the rear of the home overlooking Kentucky Lake. A large covered porch sits on the lakeside of the home with a short pathway to the private dock. This lovely furnished retreat includes all appliances, dishware, gas grill, towels, and laundry supplies. 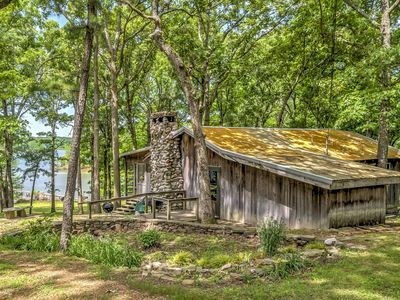 Nestled in a small cove off of Kentucky Lake; this home makes for an amazing getaway! Magnolia Suites Townhouse unit is a large 2 bedroom with brand new furniture and luxury mattresses! This unit is 2 stories and has lake views from the upper deck. We also have two other 2 bedroom units and two 3 bedroom units available. The kitchen is a chef's dream with light flooding through the many windows, and all the amenities that you would have at home. The Bed Setup: - The master bedroom is huge, has a brand new King size bed, dresser and mirror with a nightstand and a large closet! - Second bedroom is also huge and has 2 queen size beds with a night stand and a large closet! - There are 2 brand new queen size sleeper sofas in the living room with upgraded mattresses. We also put in a new 55” smart TV with cable so you can connect your Netflix or watch cable. Stroll the 150 yards to the lake or laze away your days on one of the balconies, or grill and sip a cool beverage in the courtyard. Feel the stress melt away at Magnolia Suites! Area Attractions: Wander down to Ralph’s Harborview Bar & Grill for a wonderful breakfast, lunch or dinner or if you prefer a sandwich Center Hill Market is an easy drive for a delicious burger or hand-made sandwich. We also are a short drive to get fast food in Benton, Draffenville or Calvert City. We also have charcoal and gas grills available to cook up your own meals. We are walking distance to Moor’s Resort & Marina where you can get all your tackle needs and rent a pontoon, wave runner or fishing boat for a day on beautiful Kentucky Lake! If you bring your own boat, they have a ramp to launch and boat slips for rent. Welcome to our home on beautiful ky lake ! Fully furnished 5 bedroom waterfront property in a quiet residential neighborhood with two separate balconies and a screened in porch for soaking in the gorgeous views and amazing sunrises! Sleeps 8 adults and 4 children comfortably, and perfect for two small families. This property has two different master areas, one with a queen bed and attached bath with garden tub, shower, and double vanity. The lower level has a king bed and an attached bunk room, perfect for the kids. Both masters have beautiful lake views. Three additional bedrooms are available, one with a queen (water view), one with two twins and one with two daybeds. This property does NOT have a DOCK or ACCESS to the lake; however, Moors Marina, a full service facility, is located just minutes away. An outdoor fire pit is perfect for those cool nights. We welcome fishermen and have the perfect driveway for your boat trailers. Holiday dates are flexible for the week of Memorial day, 4th of July, and Labor day. This Condo is part of "The Dens" condos at Big Bear Resort. It is 3 bedroom, 2 bath with an additional vanity in each spare bathroom (handy for washing face / brushing teeth). King bed in the master with a connected bathroom, queen bed in one room, and two bunk beds (twin over full) in the third. Washer and dryer, under counter ICE MACHINE, and dishwasher in the condo. There is a roll away twin bed and a pack and play available for your use as well! You will have access to all of the amenities that Big Bear Resort has to offer including access to a swimming pool, a sandy beach right outside the condo, gazebos, fire pit right on the water, and rental opportunities at the marina (pontoon, speedboat, fishing boat, paddleboat, knee board, tubes, skis, etc.) 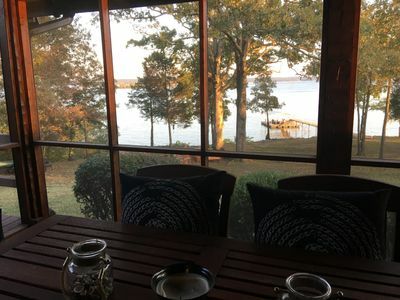 The view from the patio of this condo is one of the best on the lake, you have a perfectly unobstructed view of the main lake from a convenient screened in porch. The condo is on the first floor, so you have easy access and will not have to worry with stairs. If you'd like a boat slip, the marina has low cost nightly rental slips for your use as low as $15 / day. I've also left a couple yard games for your use, Bocce Ball, Corn Hole, and the resort has a volleyball net and basketball court. There is a gas grill in the garage for your use. A keurig coffee pot is also available in the kitchen. You will not be disappointed in this relaxing, luxurious condo. If you have any concerns at all with this being a new listing, please do not hesitate to call me and discuss. I am confident that I can ease your mind as we are on top of it and motivated to make sure you have an exceptional stay. Call or text The specifics of the slip rental fees are located at the Big Bear Resort website, or you can call to rent a slip... they have covered and uncovered slips available. I have found it very easy and convenient to reserve the slip, if you need any help with this please just let me know. **Disclaimers** We do not have control over the pool or beach area. Memorial Day to Labor Day is the prime season and these areas are typically in good shape and open, but it's possible before memorial or after labor day that the pool will not be open and the beach area won't be in great condition. Beautiful home. Waterfront, large porch and private boat dock. Available in May 2017 this property is beautiful! The owners are moving back close to their family. While living on the lake this was their permanent residence. In the last few years they have done many upgrades and remodeling. From adding bedrooms, to making bathrooms accessible to everyone as well as the addition of the screen porch, you all are sure to enjoy this home away from home. The house features 4 bedrooms, 3 bathrooms, all new appliances, laundry room and a porch perfect for entertaining, grilling and just enjoying the company. With a large yard and gentle slope to the water as well as private boat dock this home is suitable for all. We hope you enjoy it as much as we know you will! Our 5 BR log home is just minutes away from I-24 and Kentucky Dam Village and Marina yet the wooded lot and lakefront views make you feel like you're a world away! Enjoy the open floor plan and over 3550 sq ft on 3 levels found in this log cabin and Lindel Cedar home on KY Lake in Sledd Creek. Ideal for family reunions, multi-family vacations. Newly furnished in 2016 with 5 new queen beds and a bunk room. This 3 story home includes 3 master suites - one on each level. Beautiful views out of the 2-story wall of windows in open kitchen and great room with fireplace. 87 feet of wrap around deck provide ample space. Fully equipped with everything needed to have the comforts of home while on vacation! Plenty of room for everyone with a great room upstairs and family room downstairs. 1.3 acres of yard for the kids to play while parents watch from the expansive deck. 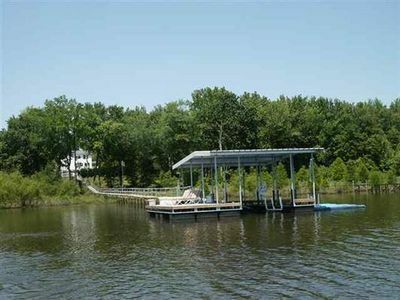 Year round deep water off the private covered dock with fish cleaning station! Relax and enjoy the peaceful tranquility of lake life!!! Located in a quiet neighborhood and privately set on a two plus acre point overlooking Kentucky Lake is our custom three level log home. This spacious 3400 sq. ft. home has hand hewn beams throughout and stunning views from all main and upper living areas. The master bedroom includes large windows that look over the lake. Imagine waking up and looking at the morning view from the comfort of your bed. The home is located on Kentucky Lake, 108 miles from Nashville, TN and 20 miles from shopping and numerous restaurants in nearby Murray, KY. Within minutes of Cypress Springs Resort marina which offers a boat ramp, overnight slip rentals by the day, boat/jets ski rentals, and a wonderful restaurant. This rustic cabin is wonderfully decorated, boasting antique and rustic furnishings. All bedrooms feature luxury mattresses and linens including 300+ thread count sheets, down comforters and pillows. While relaxing on one of the two covered porches, you can grill, dine, sun bath, enjoy music, star gaze and simply relax!. There is a large fire pit with six cedar Adirondack chairs for your comfort and relaxation. The rear covered porch facing the lake has three ceiling fans to keep the air moving on those warm summer days. Additionally, there is a screened in porch with outside dining overlooking the lake. 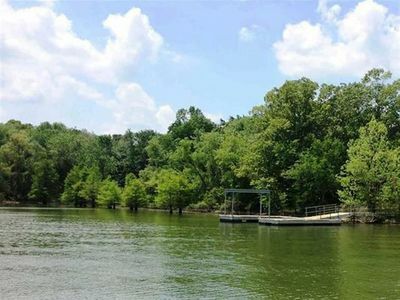 Access to the lake is a short, gently sloped walk to the covered private dock located on property. The dock has year round water for your boating, swimming and fishing enjoyment. 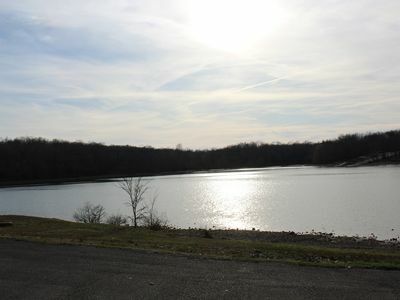 The lake offers excellent fishing, swimming, and water skiing. Several tournaments were won from bass caught from our point including an eight pound bass my father caught and mounted. Watch the sunset melt away into the lake on the dock relaxing in the five Adirondack chairs on the dock.. Bring your hiking boots and enjoy dozens of trails and fun near the cabin. We offer our guests free access to a paddle board, fishing kayak, youth kayak and a canoe. There is also ample parking for you to bring your own boat. After a full day on the lake venture downstairs to the game/movie room. A pool table, foosball table, dart board, table tennis, bar and shuffleboard table will keep you occupied while taking a break from all of the outside activities. The 65” HD flat panel LCD TV is great for movies or watching games. Also, the two large leather sofas provide additional space to relax after a day on the lake. This room features reclaimed barn wood and beams throughout. 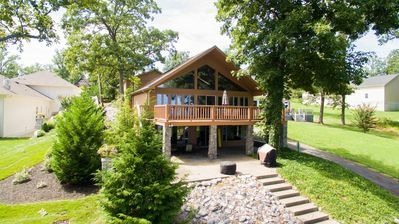 Lakefront, Quiet Area, Gorgeous Sunsets, Eagles Very Close, Family Paradise! 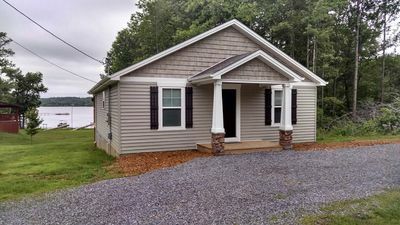 Caroline’s Dream is a privately owned 3 bedroom 2 bath home with central heat and air located on the Jonathan Creek area of Kentucky Lake. 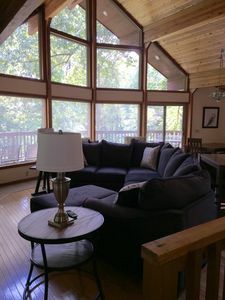 The smoke free and pet free home is perfect for a family vacation, fishing trip, or just a romantic getaway. Each spacious bedroom has a queen size bed, closet, and plenty of drawer storage for your personal items. The master suite has a double closet with dresser and the bath has a double vanity and walk-in shower. Bedroom number three has a view of the lake. 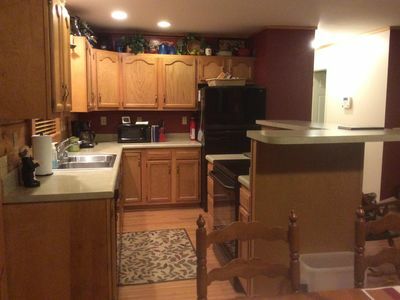 There is plenty of room in the kitchen area that is also open to the living room. The kitchen is fully equipped with a full size refrigerator, oven, microwave, and dishwasher. Dishes, glassware, cookware, etc. are provided along with a coffee pot and toaster. Bed and bath linens are included. The living room has a large flat screen television with cable and wi-fi/internet. The utility room includes a full size washer/dryer for your convenience. There is over 1,100 square feet of living space inside the home. A walkway leads to the screened porch of located at the end of the home and overlooks the lake. There is a patio set and porch swing to help you relax and watch the gorgeous sunsets. There are two carports that allow you to keep your vehicles protected from the weather. Amenities include a slip at the marina (with electric), use of the launching ramp, access to the swimming pool and miniature golf. There is a playground directly in front of the home where you can keep watch on the kids from the screened deck. 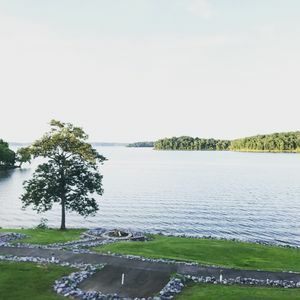 Located only minutes from numerous golf courses, The Kentucky Opry, hiking and biking trails, restaurants, and Land Between The Lakes recreational area there is an abundance of family related activities to choose from in addition to the swimming, boating, skiing, and other water related fun. 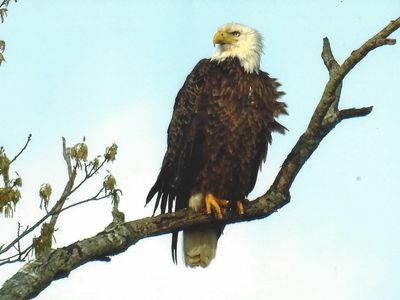 There is even a bald eagle nest located about 150 yards away so bring your binoculars! Kentucky Lakefront Chalet/Near Murray Ky & Paris Landing Area. 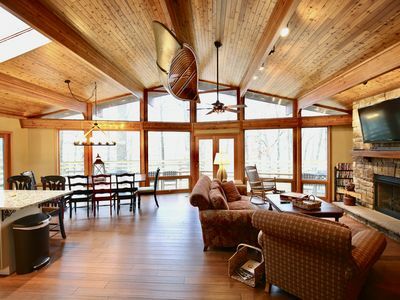 Come explore Lake Living at this Kentucky Lake Chalet. Call, Email or Text us for Specials! 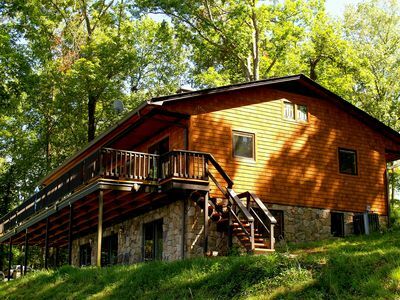 This 3 bedroom, 3 bath lake chalet is nestled into the hillside overlooking Ky Lake. The chalet-styled home boast amazing views from almost every room of the home. 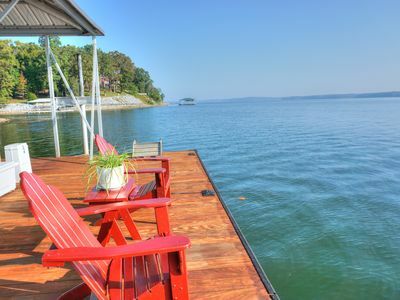 If you're looking for a lake rental to entertain family, friends or fishermen you're going to want to check out this lake-house as it's a crowd pleaser. 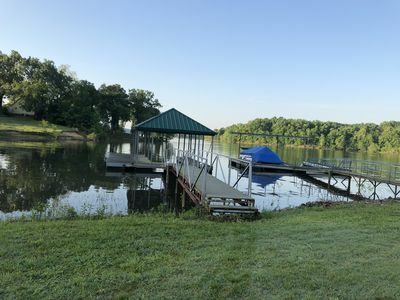 This home offers 2 acres with a private 30ft covered slip dock w/year round water, 2 jet-ski pads, boat ramp & a 4 seater mule to carry you to & from dock if needed. Enjoy the wrap-around decks for relaxing after a day on the lake or maybe a dip in the hot tub. Revel in the sun rising over the lake, view thousands of stars at night, play corn hole, and enjoy the fishing and boating this lake is famous for. On the main level, the living room boasts Italian leather furniture and two stories of windows to take in the best views of the lake . The open concept flows into the dining area and fully stocked kitchen. There is also a full bath and a large bedroom with 2 queen beds. The wrap around deck is a great gathering place to relax and enjoy the views. The upper level has a large loft area with more scenic views. It s a terrific area for the kids to play games, watch TV, or to read a book. The loft has a queen size sleeper sofa that converts this into another semi-private bedroom. The master bedroom and bathroom with slate tiles and a large shower are also on the upper level. From this bedroom you can experience the amazing views of the sun rising over the lake, its spectacular! The lower level is sure to please as the game room comes complete with a full size pool table, an oak bar with leather bar chairs, 52 Inch UHD TV, dart board, & walk out side to the screen in patio porch & enjoy the hot tub. Also on the lower level is a full bathroom and private bedroom with a queen size bed, bunk bed with a double bed, twin on top & a twin trundle. The property sleeps up to 14 (1 king, 3 queen size beds, 1 Bunk with 2 twins & 1 double bed, 1 queen sofa bed), 3 full bathrooms (one has a tub, the others have large showers), a full kitchen with all the amenities, and a game room complete with a pool table, bar and leather bar chairs. In full, there are 3 living\ seating areas, upper level deck and lower level screened in patio with plentiful seating. Cable TV on separate channels (i.e. you can watch different channels in separate rooms! ), high-speed internet access (wired or wireless) and land-line phone are provided. The community boat ramp is just around the corner for launching your water toys. If you don't have a boat, arrangements can be made for daily\weekly rental of a pontoon, speed, or fishing boats from a nearby marina. Need more room? No problem, in the spring of 2019 we will have a newly renovated 3 bedroom home located next door. Call, Email or text us for more information or weekly deals. This property is in a resort community. Just down the road from Kentucky Lake. Complete with a marina, pool and miniature golf. The Aframe has a large deck built above the ground perfect for some leisure time. Its clean with 1 queen size bed and one full size bed. It has an air conditioner upstairs and downstairs. Downstairs is a sectional couch and recliner. It has one bathroom with tub/shower. Complete with stove, and refrigerator, microwave and coffee pot, charcoal grill, towels, wash clothes, dish towels, coffee cups, plates, cups,some cookware and utensils. Ouiet community. Complete with Cable TV, DVD player and wifi. 2 night minimum. Just down the road but inside the Resort is a marina. The Resort charges a $10 fee to dock your boat at their marina. However, you can put your boat in free at Kenlake Marina or Johnathan Creek which is nearby.We also have plenty of parking for a boat or 2. There is a building outside with electricity to plug in your boat charger etc. This is a great place to enjoy fishing, hunting, boating, etc. Murray State University is 20 minutes away. 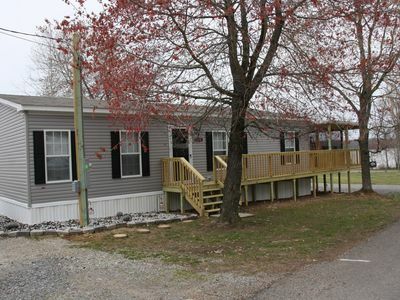 Keystone Cottages on Kentucky Lake is a 2-bedroom apartment located just a stones throw from Kentucky Lake. The cottage is nestled in the hills overlooking Buckhorn Bay and 1/4 mile from famous Moors Resort (full service marina). The apartment is 2-bedroom, 1-bath and Full Kitchen. The cottage sleeps 4-5 people comfortably. (Additional bedding may be available.) Premium Direct TV service is available in each cottage with NFL Sunday Ticket. Laundry room is available at no additional charge. Full deck and patio available for all guests needs with grill. The cottage are easily accessible from Paducah, KY (35 minutes) or Nashville, TN (2 hours). Kentucky Lake House and Boat Dock. Located in the Moors Resort area this 3 bedroom 3 bathroom updated house has terrific lake views from deck. Located on Duplex lane this property offers a private dock as well. So bring the boat and the family and enjoy a resort type atmosphere with the quietness of a single family home. Freshly remodeled wood floors and new paint with new furniture throughout the house. Convenient walking distance to restaurant, bar and marina. Set up for fun family vacations or just a friends fishing trip. 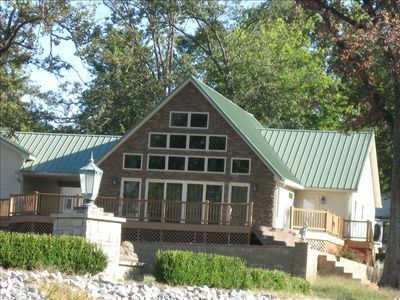 Our Kentucky lake home is a great place for a fishing trip getaway or the perfect family vacation home! It has 4 bedrooms and 3 full baths. 2 of which are master suites with their own attached bathrooms. This property was recently remodeled with all new flooring, paint & decor and we are still updating the pictures as we get it ready for the 2019 season! We are Premier Partners with VRBO and have a history of excellent reviews and customer satisfaction, you can check out our other property located about 5 minutes away (VRBO.com 799996) The 1st master bedroom includes a king bed and and private full bathroom. It also has a door with a private access to the back yard. The 2nd master bedroom has a queen size bed and a private full bathroom. Bedroom 3: twin beds, sleeps 2 Bedroom 4: Full Bed, sleeps 2 There are two living room areas both with couches/recliners. The large sectional sofa seats 6 people comfortably. The porch is perfect for sitting and enjoying the outdoors & opens out to a lake view right off the kitchen. 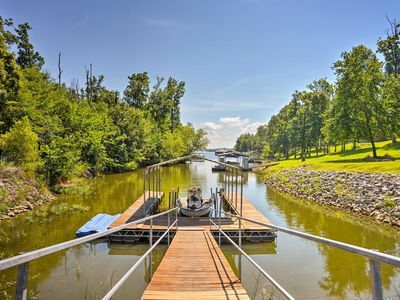 Our home features a private dock located on Ky Lake. The dock is right in the backyard with a very gentle sloping hill going straight to the water. You can drive right down to the dock. The Home is fully furnished and includes linens, towels, dishes, cooking utensils, appliances, washer/dryer, dishwasher, AC & Heat. There will be parking for up to 4 vehicles. Satellite TV and Free WiFi are also included. The Boyd's Branch Boat ramp is conveniently located just a few minutes away by car. We are located on Kentucky lake but right in the middle between downtown Murray, Ky and the Paris Landing, Buchanan Tn area. Both of which have a wide variety of restaurants, shopping & activities to choose from. This home is great for all kinds of outdoor activities like Hiking/Fishing/Boating and Biking! Located minutes from Land Between the Lakes a national recreational area home to the LBL Elk & Bison Prairie, the 1850’s KY Homeplace, a working farm where Kentucky’s history comes alive where daily chores are reenacted throughout the year. There are special events and festivals for every season. With more than 200 miles of hiking trails, the Turkey Bay Recreational riding trails for ATV/Jeeps/Dirtbikes, the Nature Station has weekly activities and tons animals/wildlife, or the Golden Pond Planetarium & Observatory, you are sure to be entertained! 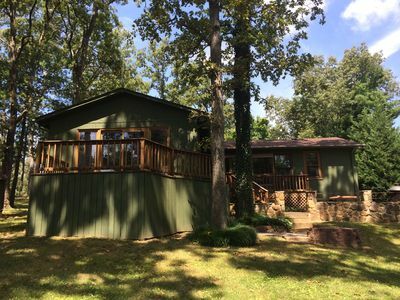 Lakefront 4BR Benton Cabin w/Private Dock! 75 Keystone is a newly remodeled, fully furnished space on a hill overlooking Buckhorn Bay with 3 bedrooms and 2 bathrooms. Both levels of the house have their own entrance, living area and bathroom, providing plenty of space. There's also an outdoor entertainment area It's located just 2 minutes from Moors Resort which offers boat rentals, fishing licenses, bait, restaurant/bar, jet ski and pontoon rentals. A Gatlinburg experience on KY Lake. Nestled sweetly on Jonathan Creek. Beautiful 3 BR, 2 BTH brick home w/ stunning views of Blood River & NEW DECK! This beautiful lakefront property was constructed in 2000 that includes a large great room with a vaulted ceiling & fireplace where the whole family can gather. 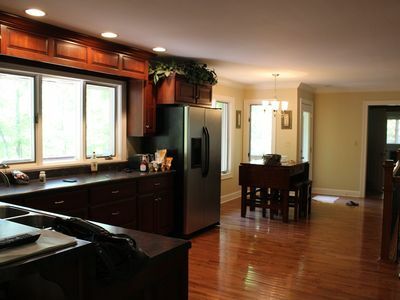 The kitchen has a large bar with stools for great conversations while cooking. This brick home has 3 bedrooms, that include a large master with on-suite and 2 other bedrooms & bath. Also included is an attached sun room with multiple windows to enjoy the breathtaking view of the lake. 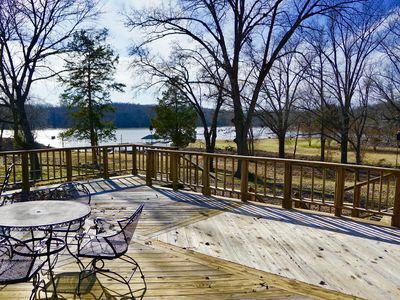 The property sits on approximately 5 acres that includes a large boat dock for your boat, swimming, fishing or just admiring the awesome views of beautiful Kentucky Lake. The house is a little over 1700 sqft. with a King bed, 2 Fulls and Twin. Bedding, bath & kitchen towels & wash clothes provided along with basic kitchen supplies. 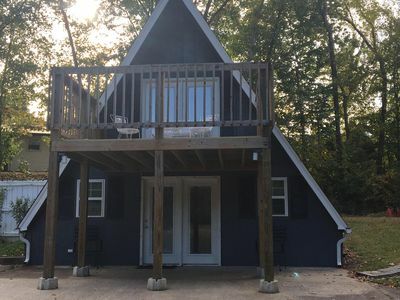 If you are either an avid fishermen or just would like a quiet retreat from your busy lifestyle this location and home will provide the perfect getaway. TVA regulates water levels so make sure to monitor the levels before launching your boat or swimming. 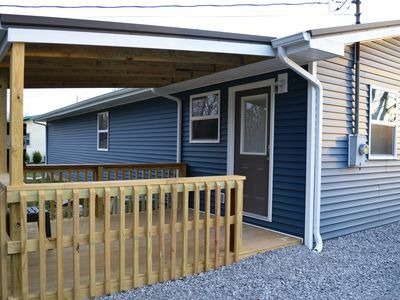 We recently added a new LARGE beautiful deck attached to the house with table, chairs, swing and seating for 7! You must take a look at the pictures. This beautifully appointed home sits water side on Buckhorn Bay, beside the Moor's Resort. 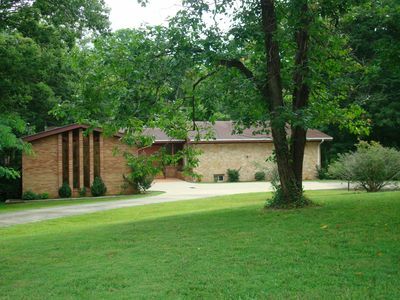 It features a very large gentle sloping back yard directly on Kentucky Lake. The home has its own private dock included (no boat). The covered dock is lighted and has electricity. Lake water levels may restrict the use of the dock, usually beginning in late August although the property has plenty of parking for boats and trailers. A nice boat ramp is located in the bay. The home features a large dining room with seating for 12. There are 4 bedrooms and will sleep 8 guests. There is a sleeper sofa in the living room. Two full bathrooms, laundry facility, Wi-Fi, fully equipped kitchen and a large family room. The exterior spaces feature 2 car covered parking spaces, a large lake-side deck, and a lower patio with a fire pit and charcoal grill.